Is this Enterprise GMBH's creation? And that is quite something, after watching the Revision 2015 demo party video streams this weekend! it took me a while to sort out all the information I have about this matter and to write everything down in the right order, but now I am ready to present you the last big mystery in the history of Enterprise Computers. Up till today there was only one small picture in Popular Computing Weekly, telling something about the new Enterprise from July 1986, as you know. The story behind this machine goes back to autumn 1985 when it became clear, that the original plans for producing/selling the 64k/128k had to be revised. The home-computer computer market was changing rapidly, the first 16bit machines were already announced. Due to the late arrival of the 64k/128k there was a variety of competitors, that had already occupied the market. Sales were not as expected and EC UK had to do something. Releasing the 128k machine earlier as planned didn't push the business. In fact sales were going down after loosing contracts with bigger department stores and retailers and they decided to develop some kind of a "super ENTERPRISE". The had not many alternatives as far as the hardware design is concerned: NICK and DAVE had to be used further on, there was no money for a redesign of the chips. Therefore first designs were more or less bigger 128k machines with built-in EPROM bank and Exdos controller. The plan was to target companies and offices with a package, that contained a business Enterprise with bundled software, monochrome monitor and a single floppy disk drive. This project got the model number 911. Right from the start it was clear, that they had to do something for getting production cost down. The assembly of the existing machine was to time consuming and therefore to expensive. The existing moulds would have to be renewed after appr. 100.000 "shots" too. Therefore they needed a new design with a reduced number of parts. A design study was started and as a result there were at least 6 different proposals. The management decided to go for draft no. 6 with some minor changes on the cooling slots on top of the machine. The final drawing (marked "1.3") went to the model maker later for a first prototype housing. The first circuit diagrams for the new machines were made out of the existing drawings of the 64k/128k machine and are dated 16.12.1985. These plans got a number of changes over the next month and the last known change is from 03.06.1986. It is not known, when EC UK started with the first prototype motherboards, but this must have been after the design study and after they had determined the final measurements of the new machine. When they had fixed final dimensions of the machine, work on the pcb started immediately. The first and only available version of the motherboard is dated somewhere in february/march 1986. At that point some parts of the old machine (the UHF modulator and it's circuits and the old power regulators) were still planned to be on the new machine. And there is no 8MHz clock circuit for the internal exdos. The old power regulators showed to be overloaded (at least they get very hot in a machine with additional ram/serial board) and a plan for an external switching power supply with 5V/12V was born, although the documentation of 25th, february 1986 show a drawing for an intermediate heat sink, that should be mounted between the old power regulators and the metal chassis. The existing metal chassis (all prototype made by a company named "Brigthon Sheet Metal") already have a hole for the power plug of the new external power-supply (the old socket does not really fit to this). 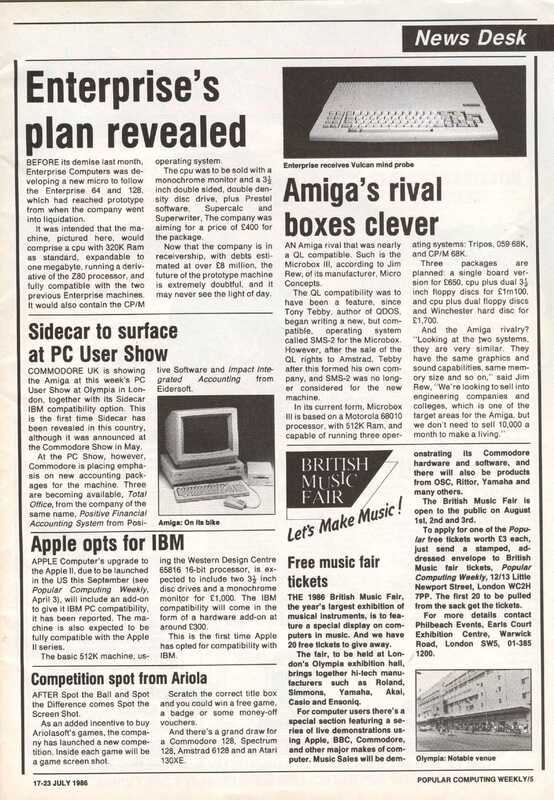 The first and only top cover for the computer (made by a model maker) was ready somewhere in april/may 1986. The same applies to the one and only keyboard that has survived. This keyboard is a PC style keyboard without internal electronics and a keyboard membrane, that has the same layout as on the 64/128k machines. On the working prototype not all keys are assigned to their correct keycodes (because EXOS 2.1 had got no changes for the new model yet) and therefore some of them are not in the position you would expect them to be, but the keyboard is working fine. EC UK worked on the prototype until they had to close down in July 1986. At this point there were no drawings for the housing, there was only a preliminary version of the metal chassis (no final construction drawings), there was no final keyboard and there was no newer versions of the pcb for the machine. And there was absolutely no work done as far as EXOS/BASIC/EXDOS and/or the planned word processor is concerned. The EXOS on the prototypes was only changed as far as the clock settings for DAVE (running on 6 MHz) is concerned and EXDOS 2.0 only contained changes to be able to format floppies on a 6 MHz machine. I assume that there must have been a lot of paperwork relating the prototype and the current state of development, but this was all scrapped/lost, when the remains of EC UK went to Broadlight Ltd. When we took over everything in autumn 1986 and discovered the prototypes, we immediately contacted Lachu Mathani, to find out more. As he had no idea about the prototype, he contacted Steve Groves, who answered him with the attached letter in November 1986. Steve made an excellent summary about the current state of development and the planned features of model 911. But his letter also showed, that IS was not too deeply involved in the development work on the prototype. Asking Lachu about the reason he told us, that IS was asking for a lot of money for this work and EC UK was not able/not willing to afford that. All in all there were only 4 PCBs, 3 chassis, 2(3) ram/serial boards and one complete prototype, that had survived. Two of the pcb's were in very bad condition and not working at all, but I kept them together with all the other stuff. The complete machine was securely packed and never touched by us. The working prototype without keyboard was used for intensive testing on our side. I made a stand-alone keyboard out of a non working EC128k machine for it to be able to use the computer and the complete prototype and my own "creation" are still running today. Kopácsy Vilmos saw this prototype machine with the separate keyboard once, when he was in Munich. I am quite sure, that this is the reason, why he was talking about the separate keyboard in this interview later. The internal model number was 911. The only name i know was PW320 or ENTERPRISE 320. I do not know what the "PW" is standing for. PW320 are more logical for 320K memory Probably someone somewhere mistyped the name... but where is the origin? I think the design started with 4Mhz Z80, and later changed to 6Mhz. Then needed the plus clock generator to the EXDOS. The Parts List also say about Z80A. In Werner's EPROM collection are a BASIC 2.1 + EXDOS 1.2 EPROM, which is for the 4Mhz 911. About the keyboard: look the XT keyboard. Then the lot of unused key holes on the prototype keyboard. I'm sure: just a new keyboard membrane produced for a existing XT keyboard, and some keys moved to new position. New EP printed key caps not produced for the prototype. Yes, you are right: The keyboard was a standard PC XT keyboard with a special membrane. The producer of the membrane for the old machines was NFI, but I think the new keyboard incl. membrane was from Far East. When we contacted NFI for the tooling of the old membrane they did not mention another project or different tools for the PW320. I see the original connectors on other shapes, it lacks the RF modulator and one of the two Tape relays, but I can see the Parallel port and the legacy Net/serial port. The Controller ports are on the keyboard, and the expansion bus is on the Ram/Serial expansion. Ah, and the cartridge Bay is now internal. But his letter also showed, that IS was not too deeply involved in the development work on the prototype. Asking Lachu about the reason he told us, that IS was asking for a lot of money for this work and EC UK was not able/not willing to afford that. I think it is quite likely that IS refused to do any more work until they had been paid for previous work, which of course they never were, resulting in IS going bankrupt. Just on the unfinished one. Werner made the keyboard for this from a dead EP128. It is the NET port. I suggest read the attached Steve Groves letter he wrote a lot of details. Page created in 0.331 seconds with 42 queries.